3 large zucchinis or yellow squash. Not the overgrown kind that are as big as your arm. They’re no good. Large is about 8 inches. Really, zucchini tastes best at about 4-6 inches, F.Y.I. Preheat oven to 400. In a large skillet or wok, melt ghee over medium heat; add zucchini, yellow squash, shallots, and garlic. Season with salt and pepper. 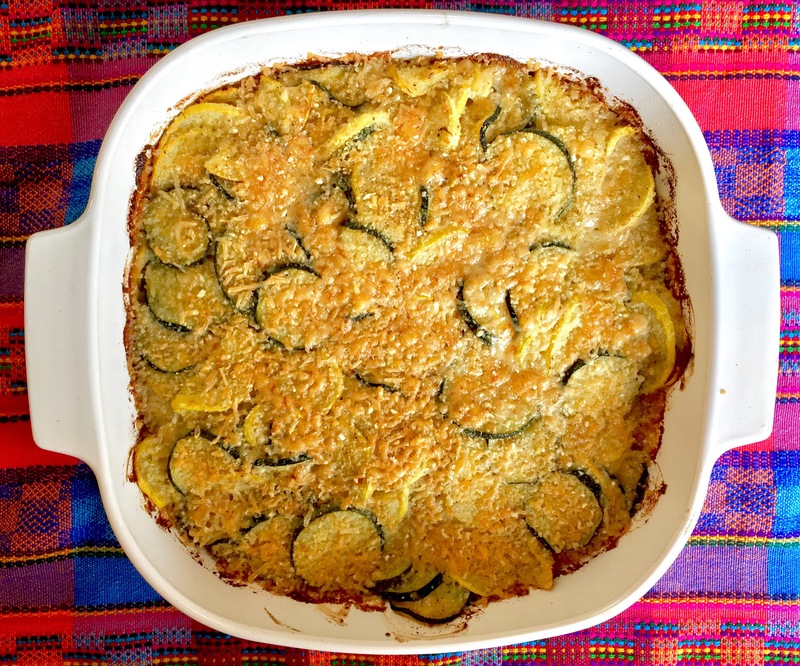 Cook, stirring occasionally, until zucchini and squash are crisp-tender, 4 to 6 minutes. I had to work in batches. Season with salt and pepper. Add cream, and cook until thickened, about 5 minutes. Remove skillet from heat; stir in 1/2 cup panko and 1/4 cup Parmesan and use a microplane zester to grate the fresh nutmeg into the mixture. Spoon mixture into a shallow 2-quart baking dish. Cover and cook for 15 minutes. Take out of the oven, uncover and sprinkle with remaining panko and Parmesan; season with salt and pepper. Bake until top is golden, 8 to 10 minutes. * You could totally do this on the grill if you don’t want to heat up your house. Just be sure that your baking dish is grill safe. I have no idea how you’ll know this. But still. *Did you know that unless you buy organic, all zucchini squash are gmo? It’s one of the most heavily gmo’d veggies out that. I think papaya is the most. Don’t care? Ignore that fact then. But if you do, buy or grow organic!